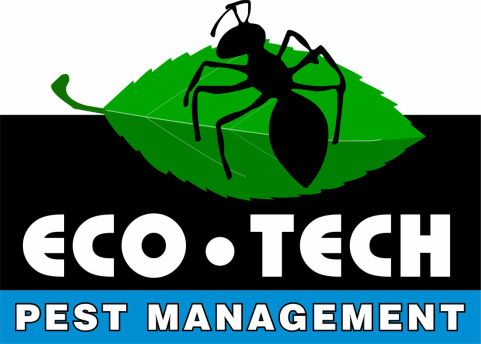 We at Eco-Tech are experts at getting rid of unwanted spiders. We begin the treatment with a thorough inspection of your home to identify areas where spiders are active. We also look for areas where spiders can gain entry into your house, which we can properly seal if you so choose. We focus our treatment specifically on the cracks, crevices, and out of the way places where spiders prefer to hide. With this focused approach we can quickly eliminate the spiders while keeping the amount of product we use indoors to a minimum. We also treat the exterior of the home to give you a barrier of protection and help prevent new spiders from getting inside. Safety and environmentally responsible practices are top priorities for our company. We only use EPA registered products and apply them with the safety of your family and pets in mind. As with all of our services, our spider treatments are backed by our written guarantee. Spiders are quite common throughout Southeastern Michigan, and while most are harmless and even beneficial, there are a few species that can pose a health threat to people. The three species that most people are concerned with are the Black Widow, Brown Recluse, and the Yellow Sac Spider. Black Widow: Although the black widow is the most dangerous of the three, it is not native to Michigan. They do turn up here on occasion when they are accidentally brought here by people. They can hitch a ride on produce, firewood, and inside people’s belongings. Black widows are easy to identify. Females are about 1/2 inch long and their abdomen is shaped like a globe. They are glossy black in color and have two red triangles on the underside of the abdomen. These triangles come together to form what looks like an hour glass. At only 1/4 inch in length the males are much smaller than females. Their abdomen is longer and narrower than that of the females and they have slightly longer legs. The severity of a black widow bite can vary depending on many factors including the depth of the bite, where the person was bitten, how much venom was injected, the person’s size, and the person’s sensitivity. Each year several deaths are attributed to black widow bites due to anaphylactic reactions. Most bites, however, are treatable. Brown Recluse: The Brown Recluse is not native to Michigan. Like the Black Widow, they do occasionally turn up here when they are accidentally brought here by people. They can hitch a ride on produce, firewood, and inside people’s belongings. Brown Recluses are easy to identify. We find that people misidentify Brown Recluses more than any other species. There are a number of native spiders with similar physical characteristics. The Brown Recluse is about one inch in diameter with a body between 1/3 and 1/2 inch in length. They are tan to brown in color and have a dark brown violin-shaped mark on their cephalothorax (the section of the body to which the legs attach). Brown Recluse spiders are commonly found indoors. They prefer areas with low human traffic and are often found in basements, bathrooms, closets, drop ceilings, around duct work, and anywhere clutter is found. Brown recluse spiders are not typically aggressive but will bite in self-defense. Most bites occur when someone accidentally rolls over the spider while sleeping in bed or when the spider is on an item and is accidentally grabbed. Initially the bite is not very painful but within 8 to 12 hours the pain can become quite intense. Over the next few days, a quarter to dime-sized ulcerous sore develops from which dead tissue regularly sloughs away. Brown recluse bites can take up to 8 weeks to heal and often leave a permanent scar. Yellow Sac Spider: Yellow sac spiders are very common in Michigan and are responsible for more bites than any other species of spider in the United States. Thankfully, their bite is not as bad as the black widow or brown recluse. The bites can be painful but usually only result in localized redness, swelling and a burning sensation at the site of the bite. Although it is thought that their bites may cause ulcerous sores like that of the brown recluse, recent research has shown this not to entirely true. While these sores can occur, they are not common and are much less severe than the ones caused by brown recluse bites. Female yellow sac spiders are between 3/16 and 3/8 inch long with males being between 1/8 and 5/16 inch long. They are pale yellow to pale green in color. 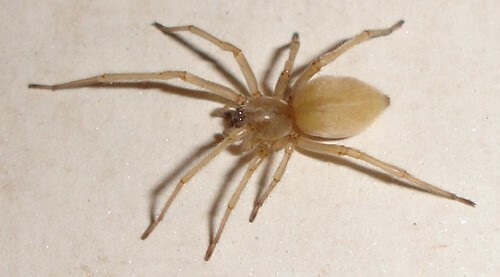 Yellow sac spiders are frequently found in homes. They make silken retreats in upper corners and wall/ceiling joints which they hide in during the day. Although they can be found indoors at any time of the year, they are particularly prevalent in the fall when the weather turns cold and food is in short supply.